Rules of the game: Checkers. To move a piece, you can do it in two different ways. Click on the piece to move. Then click on the square where to move. Press the piece to move, don't release, and drag it onto the target square. If you think the game is stuck, it's because you don't know this rule: Eating a pawn, if possible, is always a forced movement. Remember you can set the clock parameters in the game options. The game board is square, with sixty-four smaller squares, arranged in an 8x8 grid. 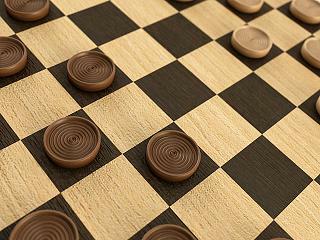 The smaller squares are alternately light and dark colored (green and buff in tournaments), in the famous "checker-board" pattern. The game of checkers is played on the dark (black or green) squares. Each player has a dark square on his far left and a light square on his far right. The double-corner is the distinctive pair of dark squares in the near right corner. Red moves first. The players take turns moving. You can make only one move per turn. You must move. If you cannot move, you lose. Players normally choose colors at random, and then alternate colors in subsequent games.